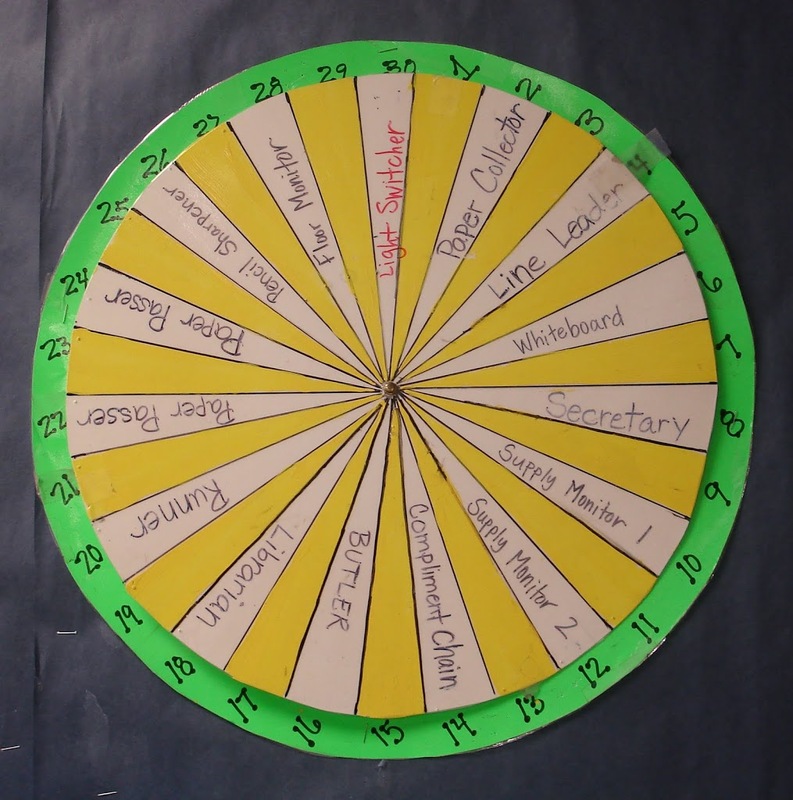 You are here: Home / Management / Behold… the Job Wheel! I want to share my job wheel, in case anyone wanted to make one this summer. I L-O-V-E my job wheel. No flipping cards, or swapping names. One little, teeny-tiny turn and it is set for the next week. The job wheel has been through many revisions through the years. When I taught 5th grade, every kid had a job. In second grade, they have a “job” every other week. This works well for me and my classroom of 28-30 kiddos. The design is simple 2 large poster board circles… the larger about 1-1/2 inches bigger than the inside. Divided into equal parts. Mine has 30 slices. The outside section is numbered 1-30 to correspond to the student’s classroom numbers. (See no cards!) The jobs are written in with an overhead marker AFTER the circles are laminated. This has saved me a bunch of times when I need to add/change a job. I have colored in every other slice with yellow. That is how I alternate weeks. The “ODDS” have jobs one week, the “EVENS” have jobs the next week. Takes me three seconds to change. If that… I love it! This one is about 15 years old… NO JOKE! Maybe it is time for an update… Add that to my list of things to do this summer! What a wonderful idea! I dislike my cards and I think this would be able to work with my second graders. Thank you! That is one of the cleverest things I have seen in a long time! Great idea. This will help me too! Cute blog! LOVING THIS!!!! Such a brilliant idea! Totally using your idea next year!!!! Keep blogging! I love this! I have a space them this year and am going to call mine planet “Jobs”! Thanks for the guide! I wanted a job wheel but didn’t quite know how to go about it. Appreciate the information! I already have a job chart, but I am going to use this for my brain breaks. Thanks for sharing such a cool idea!! Hello, I love this! I was wondering what you do when your class size changes. I really want to make one of these. Hi, I love this too, but was also wondering about class size changes. What do you do when you have less than 30 but already made 30 slots? I really love how easy this makes the changing of the jobs so I’m hoping to make it work. In the process of creating mine, struggling to make the pie pieces even. For the wheel with 30 pieces, how big is each piece? Thanks so much, I love this!